Jerrabomberra Wetlands has large bodies of standing water, with many species of resident and visiting waterbirds. It is always worth a look when we are in Canberra. Yet it wasn't the open water that held our interest during a visit last week, but rather a boggy little corner of a reed-choked creek. This scummy pool was largely algae, ooze, and mud. And during the heat of a Summer's afternoon it was an absolute magnet for wasps. The three species above were all unfamiliar to us, but we now know they represent diverse taxa and have quite distinct life histories. We've since identified them and learned a little more about each, and better appreciate why the pond holds such wide appeal. It was a hot day, but the wasps were not simply thirsty. She was gathering mud to build her nest. Before there was Canberra, she'd have found a sheltered nook under a rocky overhang or in a hollow log. Towns and cities now provide many more options, and mud-daubers' nests are commonly built in dark cracks and crevices of buildings. We watched on as she made repeated visits to her mud supply. Using her mandibles and front legs, she would excavate and form a smooth, round mud ball, before flying off to her nest. All the mud we saw her carry would have gone into the construction of a single cell, for a single egg. Only once a cell is complete does she pause in her building efforts. Then she goes hunting. Orb-weaving spiders are her prey. She'll paralyse a rather soft-bodied spider, place it at the back of the newly-made cell, then lay an egg on it. Then she heads out to collect more spiders. And she's quite selective in the type of spider and the total amount of food that she provides for her young. Spiny spiders with hard cuticles go in last - by the time the larva gets around to eating those, it will have grown strong enough to manage. Once the cell is fully provisioned, she will seal the entrance and get on with starting a new cell. She will produce only a small number of eggs - probably around eight - but it's likely that more than half will survive to emerge as adults. The effort she puts into nest construction is worth it. Each larva will pause its development over winter, pupate in early Summer, and emerge as an adult a few weeks later by chewing a hole in its clay cell. We saw these two wasps visit the pond just a couple of times. They were drinking, not collecting mud. Yet it turns out that these are also builders of mud nests. 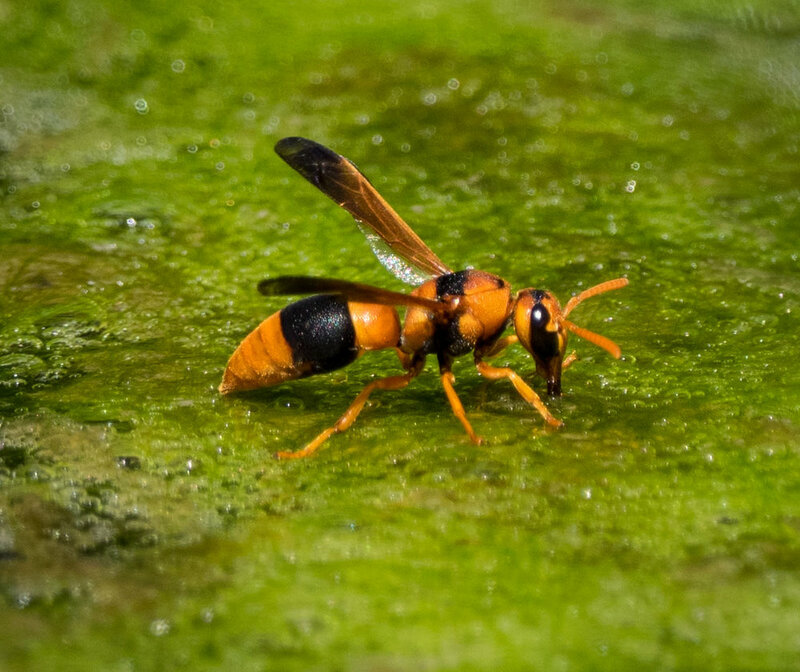 Female potter wasps don't actually collect mud - they make it. They collect water, then visit a selected soil 'quarry site', and prepare a mud ball using their mouthparts. It can take hours and 50-100 quarry visits to provide enough mud for the construction of a single cell. Like Sceliphron, Abispa also takes advantage of human construction for nesting sites. But Abispa's provisioning and care strategy is a little different to the mud-dauber. For a start, she collects caterpillars, not spiders. And secondly, she doesn't simply stock the larder and close the door. Rather, she lays her egg in the completed chamber and then waits for it to hatch before fetching her offspring's first meal. And she continues to clean the cell of debris and provide further food as the larva develops. Only after about six days does she seal the cell and start another one alongside. Another two wasps seen drinking from the pond were a less welcome sight. 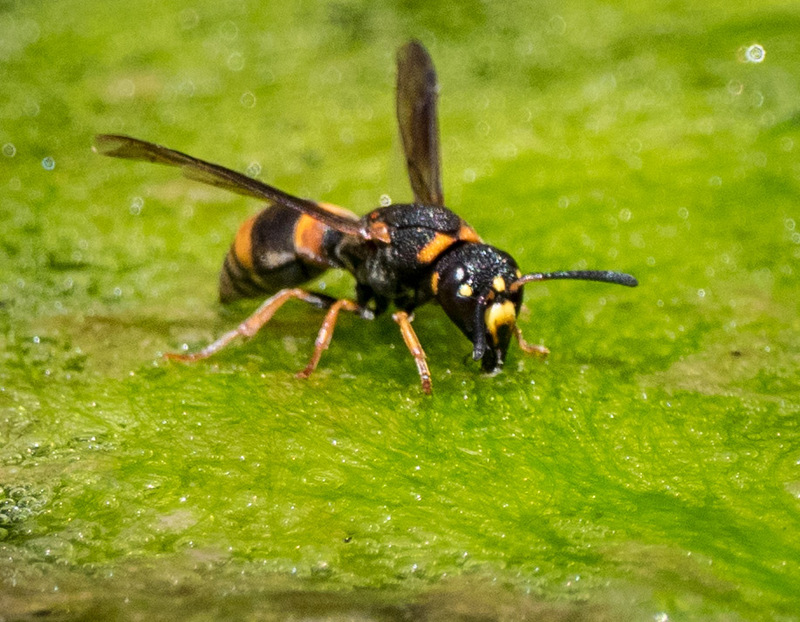 The European Wasp (Vespula germanica) and the Asian Paper Wasp (Polistes chinensis) are both invasive species. Polistes chinensis was the most numerous of all the wasps we saw. The genus, however, is cosmopolitan - for example, Polistes humilis is a common, native species of our home forest environment. Elgar, M.A. & Jebb, M. (1999). 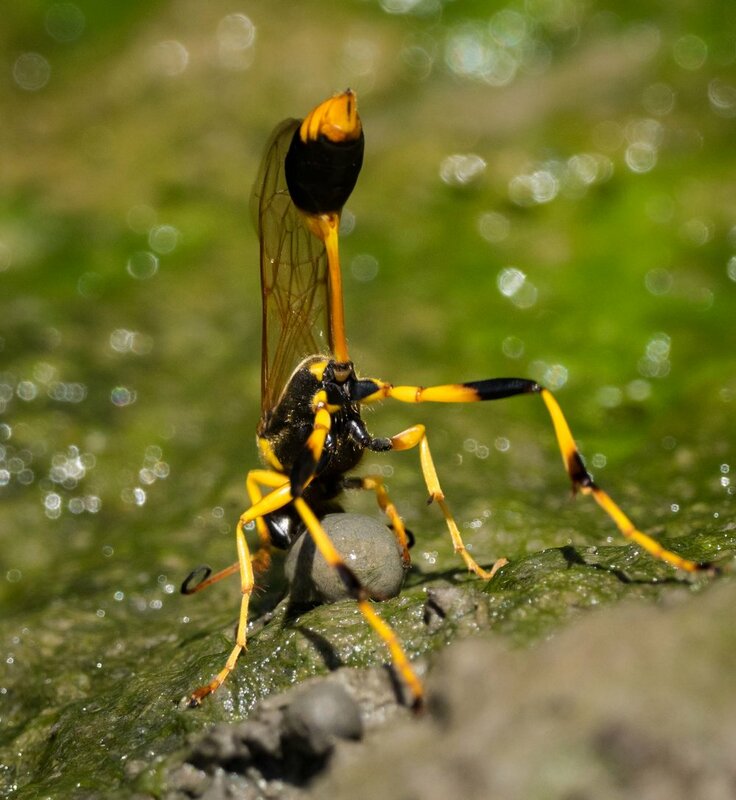 Nest provisioning in the mud-dauber wasp Sceliphron laetum (F.Smith): Body mass and taxa specific prey selection. Behaviour, 136, 147-159. Matthews, R.W. & Matthews, J.R. (2009). Nesting behaviour of Abispa ephippium (Fabricius) (Hymenoptera; Vespidae; Eumeninae): Extended parental care in an Australian mason wasp. Psyche, 2009, Article 851694. Congregations of burrowing wasps are distracting me from my pursuit of native bees ... for now, at least.